Apparently, you can find almost anything on Craigslist, including a rideable Tyrannosaurus Rex-shaped bike that’s 8.5 feet tall and 12 feet long. Designed and created by an engineer/bicycle fabricator, “Sue” has a head that works like a marionette and includes a working jaw, arms that attach to pedals, and a comfortable cruising speed of 7 mph. Although we might suggest your little one learn on something a bit more appropriate for his size, we are pretty sure you would be the envy of all your co-workers when you lock Sue in next to the other Schwinns on the bike rack. The T-Rex bike was actually designed for special appearances such as parades, where she can wave at her adoring fans, “answer” questions, or even snap at unruly crowds. Although Sue isn’t quite as tough as the T-Rex we’ve come to know and fear, and the immensity of her awesomeness comes with a $2,000 price tag, we think the look on our child’s face when this T-Rex makes an appearance at her soccer game would be priceless. Apparently, you can find almost anything on Craigslist, including a rideable�Tyrannosaurus Rex-shaped bike that's 8.5 feet tall and 12 feet long. Designed and created by an engineer/bicycle fabricator, "Sue"�has a head that works like a marionette and includes a working jaw, arms that attach to pedals, and a comfortable cruising speed of 7 mph. Although we might suggest your little one learn on something a bit more appropriate for his size, we are pretty sure you would be the envy of all your co-workers when you lock Sue in next to the other Schwinns on the bike rack. 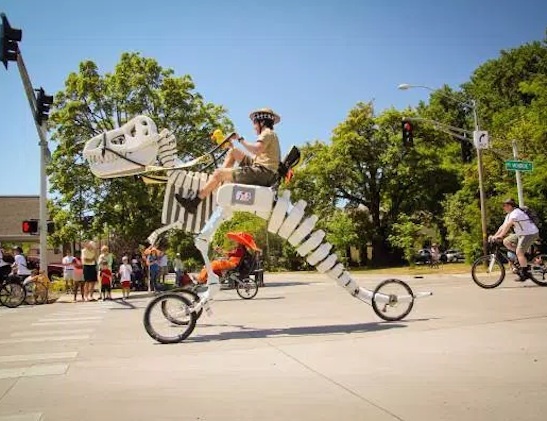 The T-Rex bike was actually designed for special appearances such as parades, where she can wave at her adoring fans, "answer" questions, or even snap at unruly crowds. Although Sue isn't quite as tough as the T-Rex we've come to know and fear, and the immensity of her awesomeness comes with a $2,000 price tag, we think the look on our child's face when this T-Rex makes an appearance at her soccer game would be priceless.